The KidiBuzz™ Web Browser gives your child a safe environment to explore the Internet by limiting the sites he or she is allowed to visit. Only sites that have been pre-approved can be visited. Access to all other sites is prohibited. 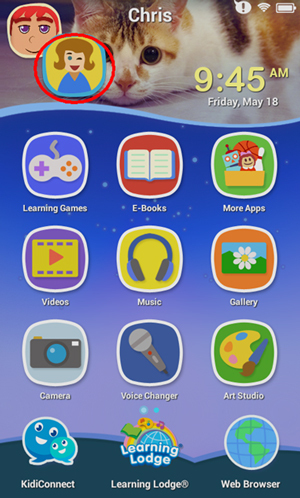 For your convenience, VTech has selected websites, pictures, videos and games with kid-safe content. 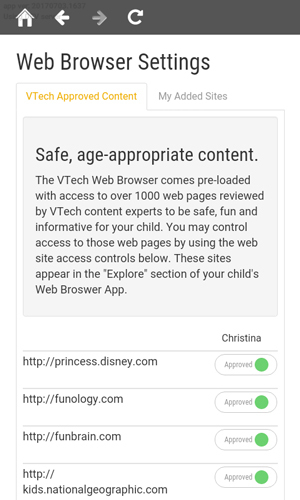 However, you can customize the sites your child is allowed to visit by adding sites of your own or block sites from the VTech Approved Content list. 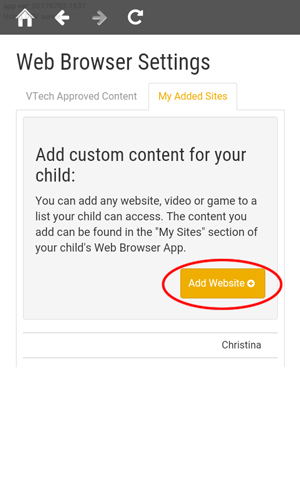 Follow the steps below to customize your child's site list. 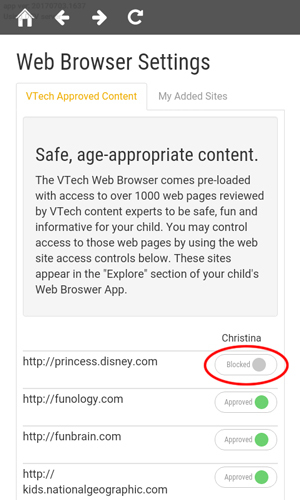 Select "Approved Sites" from the Parent Settings menu. This will open the Web Browser Settings page. 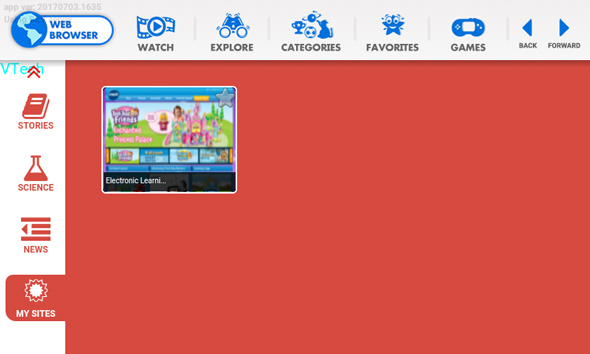 You can see all the VTech-approved sites here under the "VTech Approved Content" tab. To block one of the pre-approved sites, just touch the green circle next to it. The circle will turn to grey indicating that the site has been blocked. 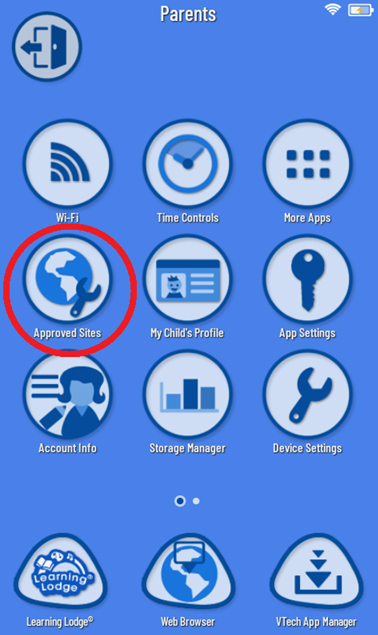 If you want to add a new website to your child's approved list, touch the "My Added Sites" tab. Then touch the "Add Website" button. 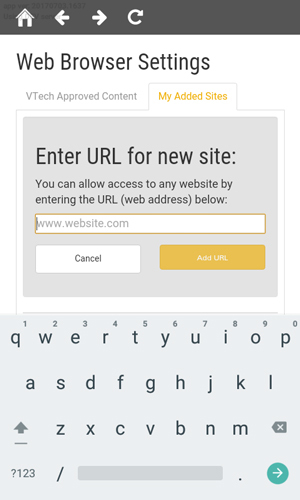 Enter the URL of the site you want to add on the next page. Touch the "Add URL" button when you're done. A message will appear asking if you want to grant access to the entire site or just to the specific page you entered. 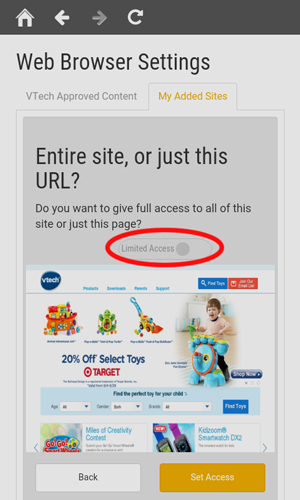 If you grant access to the entire site, your child will be able to access all pages within that domain. For example, if you add a link to an article about volcanoes from Discovery Kids and choose "Limited Access", your child will only have access to that article. 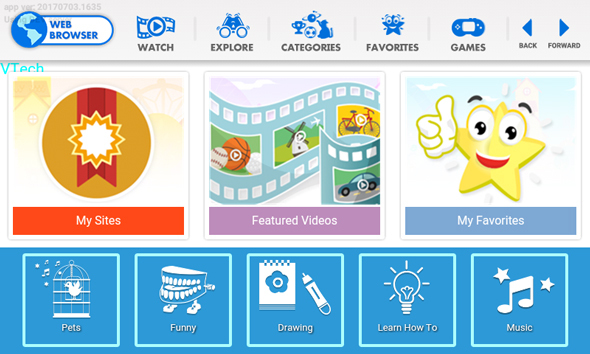 If you allow your child full access, they will be able to view all content from the Discovery Kids site. 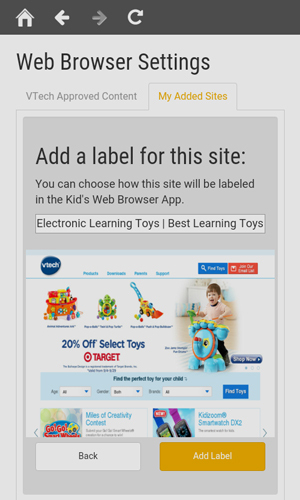 Next, add a label if you want to change how the site will be named in your child's Web Browser app. Once the website is added, it will appear in the "My Sites" section of your child's Web Browser. If you want to edit a website you added later on, go to the "My Added Sites" tab and touch the pencil icon next to the site address. 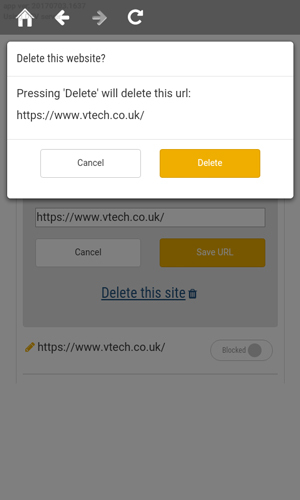 To delete a site, touch the pencil icon then touch "Delete this site". Note: You can only edit or delete the websites you add. 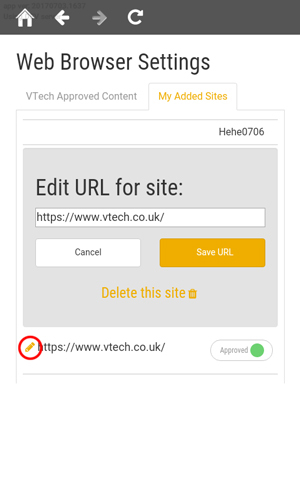 The pre-approved sites selected by VTech can not be deleted.